LAS VEGAS –Some unintended consequences of the legalization of recreational marijuana in Nevada has forced medical marijuana buyers to return to the black market, KTNV reported. A woman told KTNV that some medical marijuana patients can’t afford “the price gouging” at dispensaries so they are finding it through illegal methods. Emily Wilson said she found refuge in Las Vegas due to medical marijuana. A chest surgery left the yoga instructor in years of pain that eventually only cannabis could cure. A majority of voters spoke and legalized recreational marijuana in Nevada. The herbal medicine she’s turned to has since seen a major price hike. “Now, our prices have almost doubled in some places,” she said. The staff at Relief Dispensary admitted to KTNV the prices have hiked due to new taxes and a boom in demand, but don’t suggest patients return to the black market. 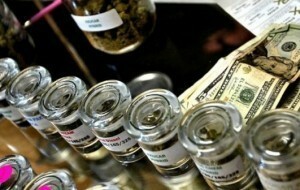 To offset the costs– dispensaries are offering incentives to medical card holders. “We allow them to come to the front of the line. We try to keep everything in stock that our patients are reliant upon,” LaWatsch said.